This is both elegant and functional. It would be a perfect solution to all rooms with limited closet space. 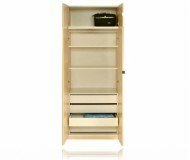 It has 3 adjustable shelves and 4 Interior drawers. All these are to keep clothing and footwear in order. It would be appropriate for a moderately large room as storage space would not be lacking. This wardrobe gives our customers a feeling of warmth with its multiple detail option and modularity in both form and function in elegance. It is simply a reflection of style and sophistication for high classed bedrooms. It would be a brilliant idea to add additional clothing space for your children's bedroom. It is simply a good buy; money wise and so also considering utility.